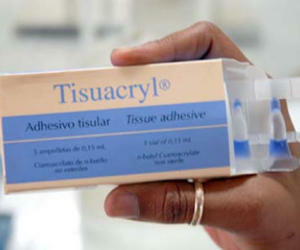 Participants in the VI International Congress on Biomaterials, Biomat 2014, scientists ratified in Havana, effective use of Tisuacryl, a Cuban tissue adhesive used in surgery. The Tisuacryl has been used in Cuba for 14 years with very good results since it was registered in 1996 and was first used in skin wounds. This replaces or supplements the suture. Since 1998 is used in dentistry, mainly in maxillofacial and periodontal surgery and dental implants. It’s also widely used in children because its use is less traumatic than the suture. This product, awarded in 2002 by the Academy of Sciences of Cuba, gaining adherents in Latin America as in Mexico, in June this year two lots were requested. Tisuacryl helps raise the quality of life because it does not require healing material after application, and can be used at any level provided that it complies with the requirement of joining tissues that are as close as possible.